Sorry but Lets are only available between 24th May and 27th September. Most Lets are Monday to Friday with some Friday to Friday Lets. Sorry no weekend only Lets. Payment details - Payment is normally by Cheque or bank transfer. When we receive a booking we will hold the let for seven days, when we receive the non refundable deposit we will send out a receipt and details via email. Balance payment will need to reach us within 42 days prior to let, we will then send out final written receipt, Key Authorisation and Fun Works pass application forms. 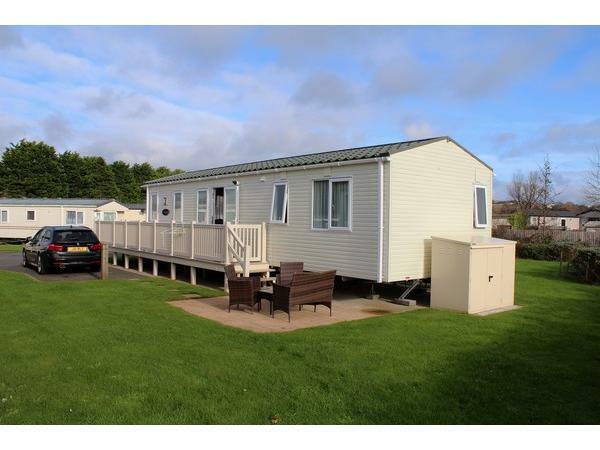 As new south facing 2 bedroom 4 berth Holiday Home sited on large plot which was recently developed on the Osprey area of Kiln Park. 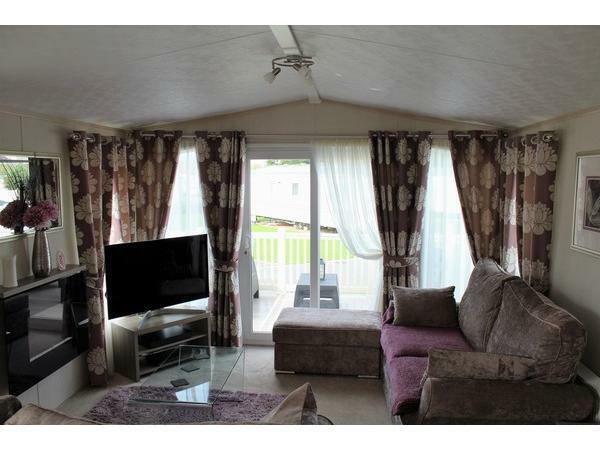 The Caravan benefits from double glazing and gas central heating throughout. 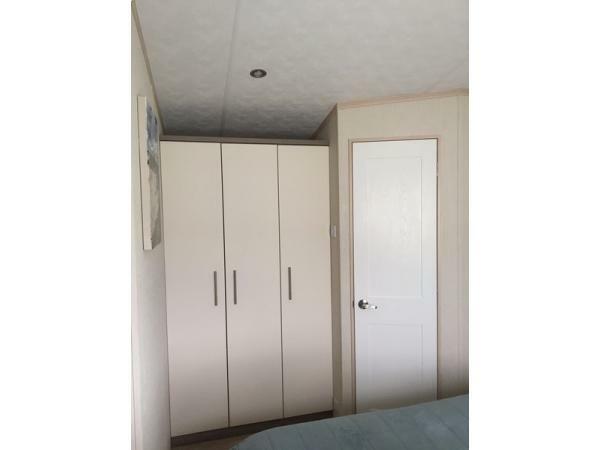 For added privacy the caravan benefits from en-suite to the master bedroom. The caravan measures 38 feet by 12 feet with added Decking to the front and side. The lounge is spacious and comfortable with Freeview Cable Digital TV and DVD. 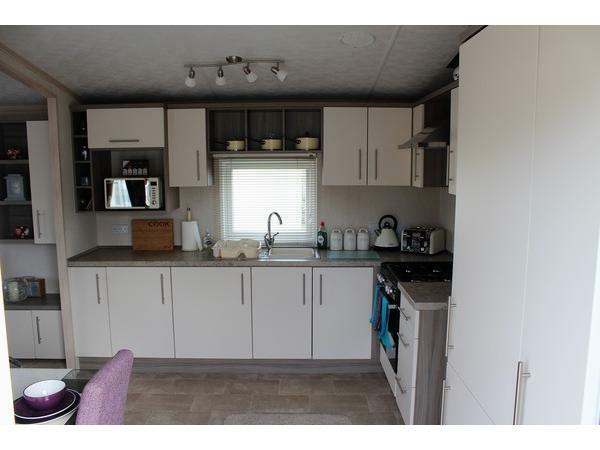 The kitchen offers a full size gas cooker, separate fridge and freezer, microwave, kettle and toaster. 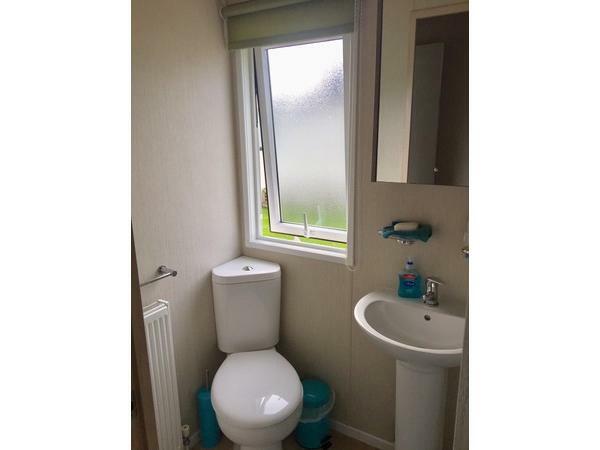 The bathroom comprises of large shower unit, toilet, washbasin and cabinet. 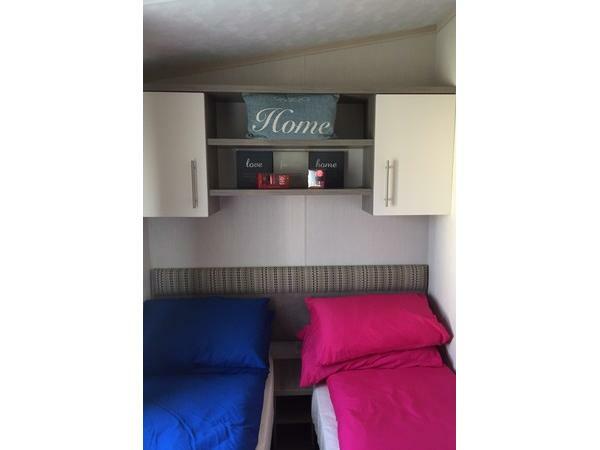 The double bedroom comes with Freeview Digital TV, five foot wide King size bed and en-suite bathroom comprising of toilet, washbasin and cabinet. 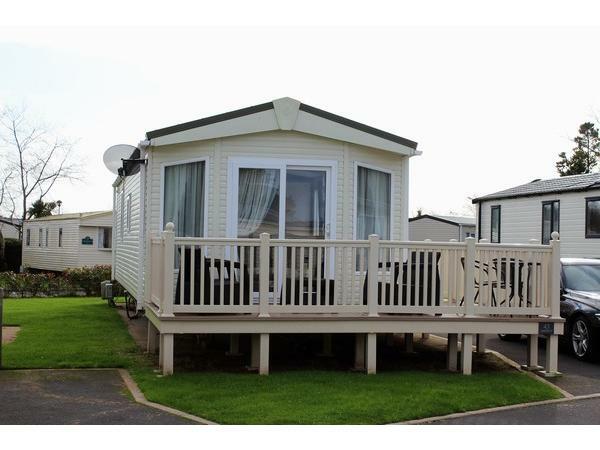 Our Caravan is situated in a prime position at Kiln park and close to the outdoor pool, children’s play area and entertainment at Kiln Park. 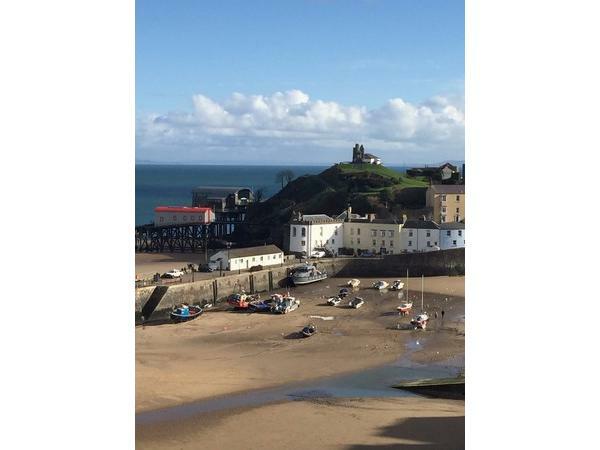 We are only a 10 minute walk to the Sandy beach or the Historic town of Tenby and the beautiful Pembrokeshire countryside. Fun works passes are not included, but are available direct from Kiln park. We will send you the pass application form (prices are between £9.50 and £33.25 per person per stay). Lets are Monday to Friday (4 Nights) or Friday to Friday (7 Nights), see calendar for full details. Sorry no weekend short breaks. 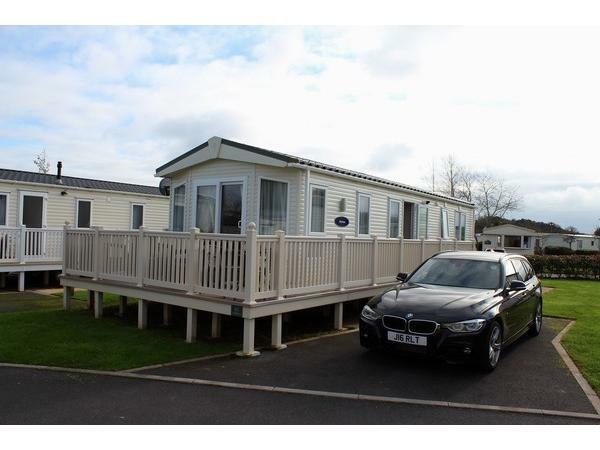 Our caravan Meets all the latest Mandatory Health and Safety Requirements set out by Haven Holidays and Kiln Park, e.g. up to date Gas, Flue and Vent, Electricity and PAT testing etc. Payment details - Payment by Cheque or bank transfer. 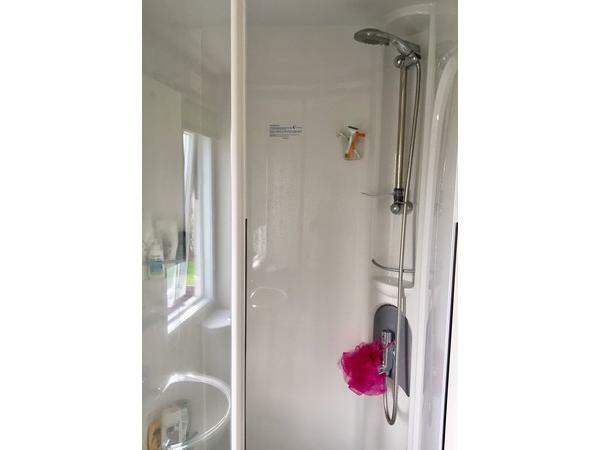 When we receive a booking we will hold the let for seven days, when we receive the non refundable deposit of £100 we will then send out a receipt and details via email. If booking is made within 42 days prior to let then the total payment will need to be made. The person named on the booking form will be responsible for all the members of his/her party. A contract between you and us will come into existence with this booking. To secure a booking an agreed deposit for each week booked must be received.The deposit is non refundable in the event of you having to cancel. In the event of us having to cancel your booking due to circumstances beyond our control then all monies paid by you will be refunded immediately. Outstanding balance must be received 42 days prior to holiday start date. Failure to pay the full cost of your holiday by the balance due date may result in the cancellation of your holiday reservation without any refund. If you wish to cancel your holiday please telephone mobile 07572 440173 or (01639) 710981. Your cancellation must also be notified to us in writing. Your cancellation date will start from the day we receive your written confirmation. In addition to any charge for privilege passes you will incur the following cancellation charges as shown below, which will cover our costs. key Collection and Fun Works passes is via enclosed form, fill it out and follow instructions on enclosed information form. You will need to contact the park directly to arrange payment of fun work passes. You will need to make the payment a minimum of two weeks prior to the commencement of you holiday. Failure to comply could result in an additional charge. This new system should speed up your your entry to park. The keys are to be collected from reception no earlier than 2.00p.m. on the day of arrival and caravan vacated no later than 10.00a.m. on day of departure and keys to be returned to reception. 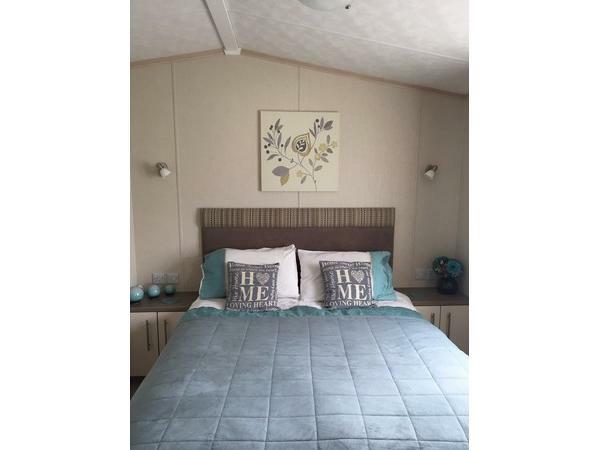 You the hirer are responsible for the caravan and undertake all reasonable care of it and to replace any breakages or damage cause, the caravan is inspected at the start and the end of the let. All items of inventory can be purchased from kiln park stores located at the main reception. We the owners will not be liable for any injury or death, loss of property, damage suffered by the hirer or any member of your party, your belongings are also your own risk during your stay. No clothes line to be erected under any circumstances. No tents to be used between caravans. 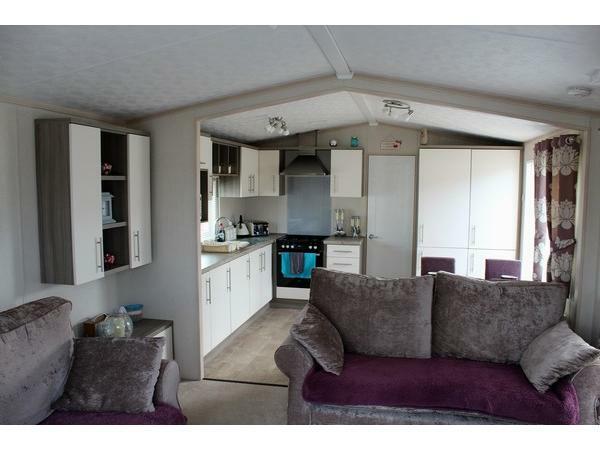 All electrical and gas appliances in the caravan are tested once a year. This is for your protection. Caravan is strictly a four birth. In the event of any problems caused by occupants or damage caused to caravans or any facilities on the park then the whole party will be removed from the park and will be duly prosecuted. Our caravan has a strict policy on No-smoking and No pets. Quilts and pillows will be provided for the double bed (5ft wide) and the two single beds. Please ensure you take your own sheets, quiltcovers and pillowcases. We wish to give you time to consider these conditions. If they are unacceptable to you then please contact us within 4 working days and confirm in writing for a refund.